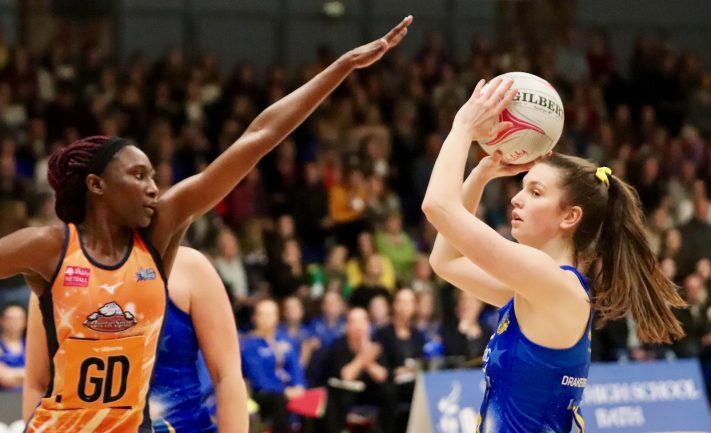 Team Bath Netball moved back into the top four of an incredibly competitive 2019 Vitality Netball Superleague table after a strong last quarter saw them finally shake off a determined challenge from South West rivals Severn Stars at the Team Bath Arena tonight. The Sitec-sponsored Blue & Gold had seen their four-goal half-time lead cut to two going into the final quarter of this rearranged derby – sponsored by Royal High School Bath – and Stars had a couple of chances to draw level before good pressure right across the court helped the hosts regain some breathing space. Five unanswered goals in the closing stages saw Team Bath secure a 53-43 victory, their fifth win in a row, and move up to fourth in the table – three points behind leaders Manchester Thunder and level with Saracens Mavericks, Wasps and Loughborough Lightning as an intriguing semi-final battle heats up. 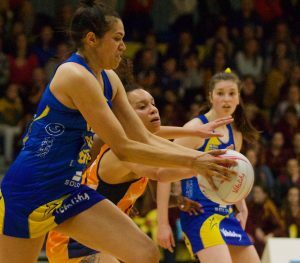 Anna Stembridge, Team Bath Netball Head Superleague Coach, said: “It was important to build confidence, get the three points on the board and keep the momentum going. “Credit to Stars, particularly in that third quarter, and we were asked a few questions but ultimately we are very confident about the way in which we want to play the game. Defender Summer Artman, who was the Genuine Car Services Player of the Match, added: “It was a real hard fight and credit to Stars, they really pushed us, but that’s our fifth win on the bounce and we’ll definitely take that into the next game. Both teams went into the game – rescheduled after being postponed in February due to snow – on the back of close-fought contests over the weekend, Team Bath beating Strathclyde Sirens 51-47 on Friday and Stars being edged out 54-53 by Loughborough Lightning on Saturday. The first quarter here was also tightly contested, with both teams forcing plenty of turnover ball but struggling to make the most of it. Team Bath were rushing passes in attack but, with co-captain Eboni Usoro-Brown urging her team-mates to keep calm, they began to settle as the quarter went on and looked to be building momentum when they opened up a 9-6 lead. Stars fought back strongly, though, and Maryka Holtzhausen scored with the last shot of a well-contested quarter to level the scores at 11-11. It remained evenly matched in the opening stages of the second quarter but the Team Bath defence of Usoro-Brown, Imogen Allison and Artman, who was relishing her battle with rangy shooter Georgia Rowe, began to get the upper hand. Accurate finishing by Sophie Drakeford-Lewis and Kim Commane from good supply by Mia Ritchie and Rachel Shaw saw the hosts stretch their lead to five but Stars – who introduced former Team Bath attacker Paige Reed as part of a reshuffle – refused to let the game get away from them and cut the gap to 26-22 at half-time. 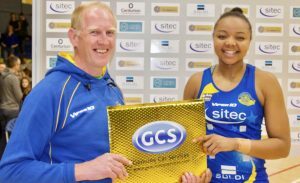 The Blue & Gold made two changes at the interval, introducing Serena Guthrie at C and Beryl Friday at GS, and they got the third quarter off to a flying start, stretching their lead out to seven, before Stars fought back once again. Errors crept back into Team Bath’s play as the visitors closed the gap to 35-34 and had two chances to level the score but both were squandered and a couple of nerveless finishes at the other end from Friday, plus great defence right across the court in the closing seconds, ensured the hosts had their noses in front at 37-35 going into the final quarter. Stars forced the first turnover of that period and had another chance to make it all square but a wonderful reach from Usoro-Brown retrieved possession for Team Bath, who went on to stretch their lead to four following another flying interception from Artman. It remained nip and tuck for a while but, midway through the quarter, Team Bath finally began to pull away as strong defence was complemented by some fantastic finishing from Friday and Drakeford-Lewis. A run of five unanswered goals in the closing stages ensured the final score was 53-43. After their run of three successive home games, Team Bath go back on the road for back-to-back visits to Surrey Storm on Monday, April 1 (7.30pm) and defending champions Wasps on Saturday, April 6 (6pm). They are then back at the Team Bath Arena for what is shaping up to be a crunch clash in the race for a top-four finish – the visit of Loughborough Lightning on Friday, April 12 (7.30pm). Tickets for that match and the Blue & Gold’s final home game of the season – against league newcomers London Pulse on Saturday, May 4 (6pm) – are on sale now here. Changes: Q3: Guthrie – bench to C; Ritchie – C to bench; Friday – bench to GS; Commane – GS to bench. Severn Stars starting 7: GS Georgie Rowe, GA Maryka Holtzhausen, WA Iona Darroch, C Lucy Harris, WD Rebecca Oatley, GD Jodi-Ann Ward, GK Samantha Cook. Replacements: Beth Gabriel, Cara Lea Moseley, Paige Reed, Adelaide Muskwe, Shona O’Dwyer. Changes: Q2: Reed – bench to GA; Holtzhausen – GA to WA; Darroch – WA to C; Harris – C to WD; Oatley – WD to bench. Q4: Reed – GA to GS; Holtzhausen – WA to GA; Moseley – bench to WA. Quarter scores (Team Bath first): Q1 11-11. Q2 26-22 (15-11). Q3 37-35 (11-13). Q4 53-43 (16-8).